Hi everyone. Tonight I have a spread from my nature journal. 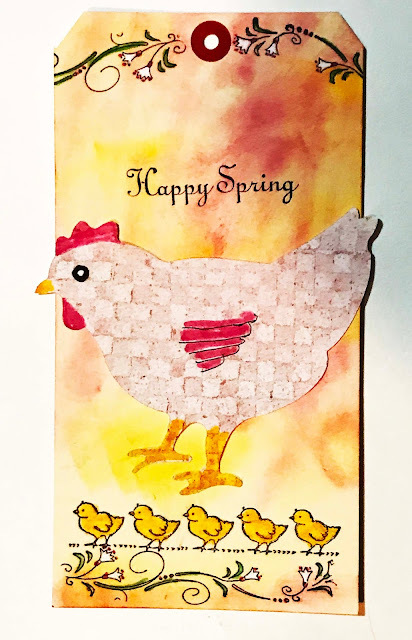 It's a spring themed page so I will link it up to Rosie's spring challenge at Art Journal Journey. Spring is usually when the birds fly north and return, although this year I haven't yet seen any summer birds back. Not surprising with all the snow. We've gotten dumped on today, and it's been dark and dreary and the snow has been flying in every which direction. It's been just a nasty day. As I write this Tuesday evening we have at least 16 inches of new snow (around 40 cm) and it suppose to snow all night. I can't even look at it! So my top photo is a slightly lightened view of my page. I have these flying geese rubber stamps and I used those, but since they are black on the darker blue they are hard to see in the photograph. Below is the page actual color. 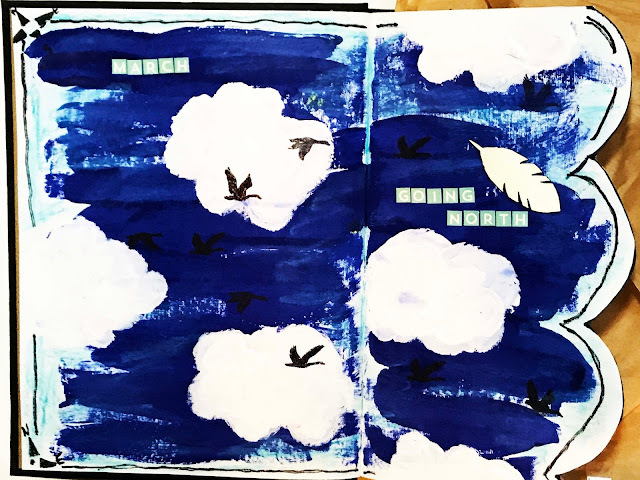 I painted the sky blue and then added the clouds, the watercolor crayon light blue edge, the black doodle and then the stamped images along with the sticker letters and the wooden feather. And I doodled in the compass points on the two left hand corners. You can see those better here. And since I was home on a snow day, I had a long play in the studio. I am going to join in to a couple of other challenges today. Here's a new one for me. I'm going to join Daniela Rogall at her Think Monday, Think ATC. This week the challenge is all about chairs. And I pulled out my little bin of spring/Easter stamps and had a lot of fun playing with them. Here's one of the pieces I made. I am linking up to Tag Tuesday and their Spring/Easter challenge. And since there's a Mama chick and her little babies, I am linking up to the Mum's the Word challenge at Try It on Tuesday. I had a lot of fun playing today-anything not to have to look at the snow coming down. Hope everyone had a sunny and more spring like Tuesday than me. I take that you will have another snow day on Wednesday, too. So glad you checked in. You have made some clever and adorable art while taking a snow day. I really like the birds flying in for spring. This is a very, very clever piece of art. Thanks for sharing it with us at Art Journal Journey. Please stay safe and let us know that all is well today. I worry about you, CJ, Corinne, and Linda. You all live in that corridor of horror right now. BTW, it's supposed to be close to 70 F here tomorrow and not a drop of moisture in sight. All 105 counties have been declared national disasters due to lack of moisture. Your page is wonderful with all these flying birds and the extra feather! And your little compass! Your chair ATC is beautiful, I like the shape of the chair, this pink and yellow color and the cool textures! This happy spring tag is all over lovely - and let us hope for spring to come finally! Relax :-) Wonderful and inviting, thanks for joining! 3 fabulous pieces - you have been busy Erika. The Geese stamps are really nice, love the colour on that spread and shape of the pages.. 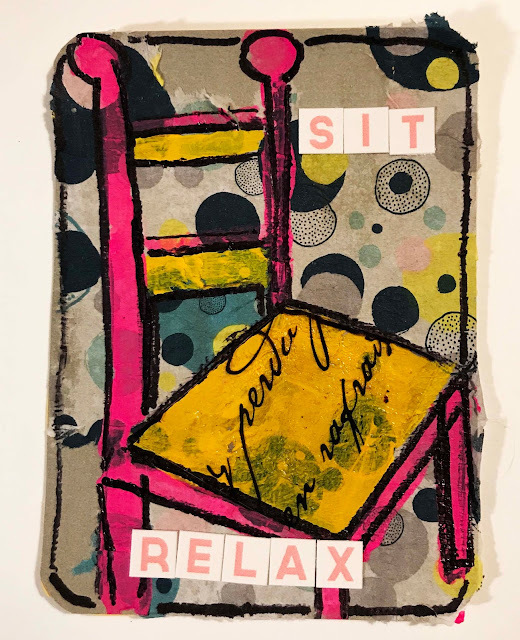 Your chair is cool - not sure what is drawn/painted and what collaged? but I love it. Wow 16 inches of snow! - wondering did you get the extra snow on top of that and do you ever get use to having to cope with the extreme weather you get? Keep warm and snug and safe. Oh wow - Erika you used that nasty day in a wonderful way in your studio! I am really thrilled about the fabulous blues on your amazing page - even compasses sketched! Perfection! You know how much your pages are appreciated at the Art Journal Journey collection!♥ THANK YOU!!! This chair on the ATC is just AMAZING! A little Mixed Media gem! And not to forget this lovely >Happy Spring < tag! 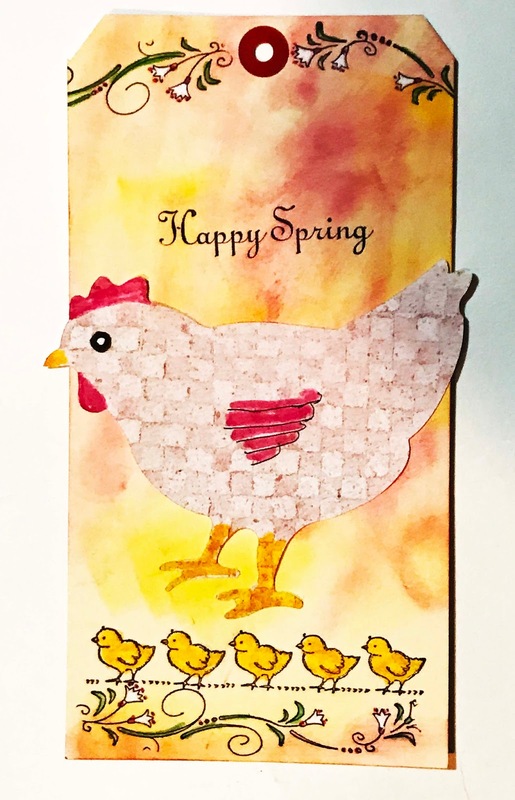 I love those delicate patterns and the little row of spring chickens! There are plusses to a snow day, aren't there? But 16 inches? Yikes. Don't you wonder when you will see solid ground again? Well, you are keeping yourself MOST well occupied! I'm rather fond of the blue birds in flight! I would love to see the Summer birds. Poor Winter birds can't even get at the feeder there's so much snow. 18 inches yesterday on top of the 15 inches last week. Uncle! Glad you were able to have a fun art day. Love the Spring chickens tag. Do you have another snow day today? I was sitting here thinking how cold I am, and then I read your post lol! I love the bird page with the scallop edge, and your abstract page is fabulous! Cute tag too! I love the rich blue colours of the sky in your journal spread , the stamp of the geese looks great, they are such graceful birds. A fantastic ATC and tag as well. Thank you Erika,I am so pleased you added Mama hen and her chicks to our Try it on Tuesdays theme. I hope it has stopped snowing , it must be real deep now outside your home. Oh, I think all of your makes are wonderful!! I love the soft colors on the Spring tag and what a cool ATC!! Hope your snow doesn't last too long, but on the bright side you got a nice 'play day. We've got snow forecast this weekend - roll on Spring! Great artwork and I love Mother hen with her chicks tag, with it's lovely bright background. Thanks for sharing with us at Try it on Tuesday.